Saturday night racing action at Swainsboro Raceway brought 104 cars to the track for some sheet metal scrubbing racing action. In the Sunoco Super Street division, Monk Gulledge and Tommy Clinard both picked up heat race wins. At the green, Gulledge took the lead with Clinard second. Brent Herndon moved inside Rye Faulk for the third position. Lap 3, Herndon took to the inside of Clinard for the second position but Clinard shut the door. Dusty Collins moved by Faulk for fourth. Lap 5, Clinard slipped high off turn 4 and Herndon took over second. Lap 6, Luke Scott and Collins make contact for the fourth position allowing Scott to take control. Five to go, Scott passes Clinard for third. After a restart from caution, Michael Slater takes over fifth from Collins. Monk Gulledge leads flag to flag taking the checkered, Brent Herndon earns second, Luke Scott third, Michael Slater fourth, and Tommy Clinard fifth. Sixteen drivers took the green in the Southland Insurance 602 Late Model division with Tyler Mimbs and Tyler Sanders leading the field to green. After going to a single file restart, Tyler Mimbs leads the field for lap one. Lap 5, Cody Overton takes over fifth from Brandon Carpenter. Two to go, Overton and Austin Scarboro battle side by side to the finish for fourth. Tyler Mimbs dominates earning his first win for the season, Tyler Sanders second, Terry Lumley third, Cody Overton held on to fourth, and Austin Scarboro fifth. In the Daniels Chevrolet Pure Stock division, Luke Scott took the lead off turn four over George Williamson. Lap 2, Brent Herndon passed Tommy Hadden on the inside for fourth. Lap 3, Williamson hot on the rear of Scott off four and gives him a bump in one. Lap 5, Herndon gets inside Kip Poole for third. Halfway, Herndon on a mission gets by Williamson for second. Two to go, Williamson all on the rear of Herndon for second. Luke Scott takes the checkered, side by side at the flag, George Williamson regains second, Brent Herndon third, Kip Poole fourth, and Jimmy Haynes fifth. Competing for $1000 to win in the Scare House of the South 440 division, 20 cars took the green. Andrew Smith took the lead over Rod Morris off turn two. Lap 3, in a battle for second Rod Morris and Reid Christensen get together off turn two. Morris was forced to pit for the night and Christensen restarted at the rear of the field. John Hooks moved up to second and Tyler Davis third. Lap 4, Cody Atkinson passed Tommy Davis on the inside for fourth. Lap 5, Tommy Davis off the pace with mechanical issues. Lap 8, Christensen already back to the fifth position from the rear. Cody Atkinson pitted losing the fourth position and John Bratcher pitted giving up fifth. Lap 11, Christensen moved into third. Andrew Smith celebrates in victory lane, Reid Christensen takes second on the last lap, Tyler Davis third, James Rogers fourth, and Richard Lastinger fifth. In the Sharp Mini Late Model division, Brad Amerson takes the lead as Tim Gerdmann gets loose off two. Lap 3, Rene Chamser brings out the caution in turn three running second. Coming from the rear, Gerdmann moves inside Matt Wise for fifth. Halfway, Richard Johnson closes in on Amerson in turn two. Five to go, Matt Harden takes over fourth. Two to go, Johnson and Amerson make contact as Johnson takes the lead. Richard Johnson wins, Brad Amerson second, Thomas Cooler third, Matt Harden fourth, and Tim Gerdmann fifth. 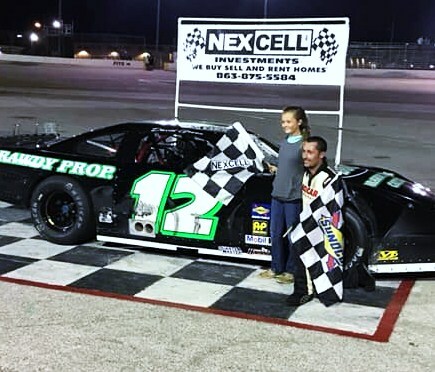 Setting the fastest qualifying time of 15.375 seconds in the Zaxby’s Crate Late Model division, Corey Dunn held the pole with Shannon Graham outside. Sixteen cars take the green, Dunn and Graham side by side off turn two, Dunn takes the lead. Lap two, Graham gets loose off turn three bringing out the caution running in the second position. Dunn leads and Pearson Lee Williams moves into the second position. Chesley Dixon tries Williams for second off turn four but Williams maintains the position. 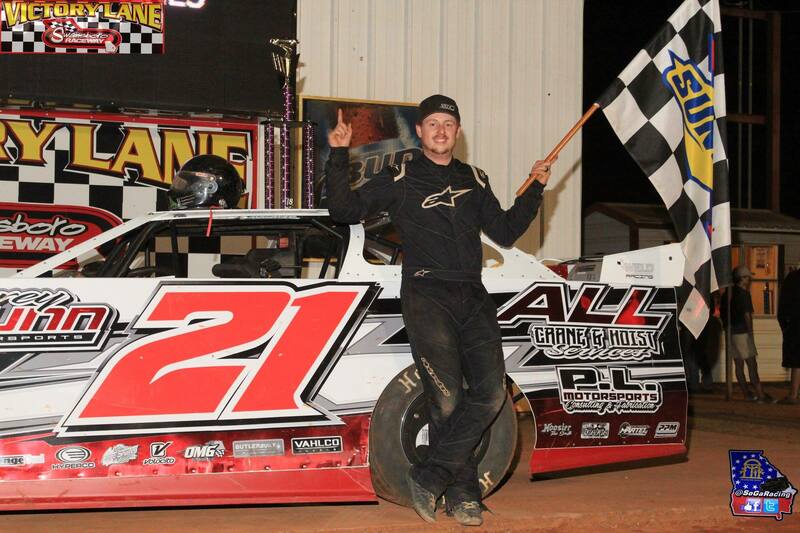 Corey Dunn earns his first win at Swainsboro Raceway, Pearson Lee Williams takes second, Chesley Dixon third, Cody Overton fourth, and Caleb Gay finishes out the top five. Ending the night in the Roger Wheeler Construction Road Warrior division, Ridge McCoy takes the lead off turn two over Jaime Foskey. Starting in the fourth position, Justin Williams loses a tire forcing him to pit for the night. Lap 4, Graham Stevenson passes Foskey for second. Ridge McCoy holds off Graham Stevenson to earn his first win at Swainsboro Raceway. Finishing out the top five Jaime Foskey in third, Kip Poole fourth, and Kay Alexander fifth. At Swainsboro Kart Track Red Plate Division 1. Tyler McCumbers, 2. Joe Brett Sullivan, 3. Trey Oliver. Green Plate Light 1. Chase Litchfield, 2. Jake Brown, 3. Tucker Baird. Green Plate Heavy 1. Chase Litchfield, 2. Jake Brown, 3. Tucker Baird. Blue Plate 1. Marley Meeks, 2. Katie Pender. Pro Blue 1. Katie Pender, 2. Marley Meeks. Predator 350 1. Brandon Green, 2. Todd Godbee, 3. Johnny Martin. Predator 375 1. Wayne Edenfield, 2. Todd Godbee, 3. Cole Reddish. Clone T3 350 1. Justin Diekemper, 2. Dylan Litchfield, 3. Joseph Diekemper. Clone T3 375 1. Justin Diekemper, 2. Dylan Litchfield, 3. Ryan Adams. Clone EL 350 1. Justin Diekemper, 2. Joseph Diekemper, 3. Chad Murray. Clone EL 375 1. Joseph Diekemper, 2. Justin Diekemper, 3. Dusty Godbee. Clone Super Heavy 425 1. Matt Black, 2. Rodney Marcus, 3. Kevin Roland. Predator 375 – 50 lap event 1. Justin Diekemper, 2. Joseph Diekemper, 3. Wayne Edenfield.